Jul 2, 2007 • An article by U.S. Geological Survey (USGS) scientists on documentation of coastal land loss, lake expansion and drainage in Alaska from 1955–2005 was recently published in the July issue of Geology, a Geological Society of America publication. 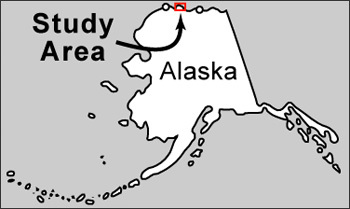 In analyzing Landsat data and topographic maps compiled from aerial photographs, scientists found that land loss in the study area north of Teshekpuk Lake in Alaska’s National Petroleum Reserve more than doubled from 1985–2005, compared to the 30-year span from 1955–1985. Analysis of these spatial images found that some areas have undergone as much as 0.9 km of coastal erosion in the past 50 years, which has drained and re-flooded arctic lakes with sea water, and impacted wildlife and human infrastructure. USGS images of Alaska’s coast during each time increment, consolidated to show the net-change in land loss and land gain, as well as coastal lake drainage and flooding, can be found at the Alaska Coastal Erosion Web site.The report, titled “Quantitative Remote Sensing Study Indicates Doubling of Coastal Erosion Rate in Past 50 Years along a Segment of the Arctic Coast of Alaska,” by USGS scientists John Mars and David Houseknecht, can be found on the Geological Society of America Web site. Scientists believe these results can help land and resource managers make informed decisions about managing the Arctic area’s oil and gas exploration and wildlife habitats, as well as contribute to a greater understanding of geologic processes and anticipate future change. This entry is filed under Energy, News, Science.